For many years I have dreamt of being able one day to make an SGN in this vineyard. Hengst is the ultimate spicy/mineral type of gewürztraminer, and this grape variety was created for this vineyard! 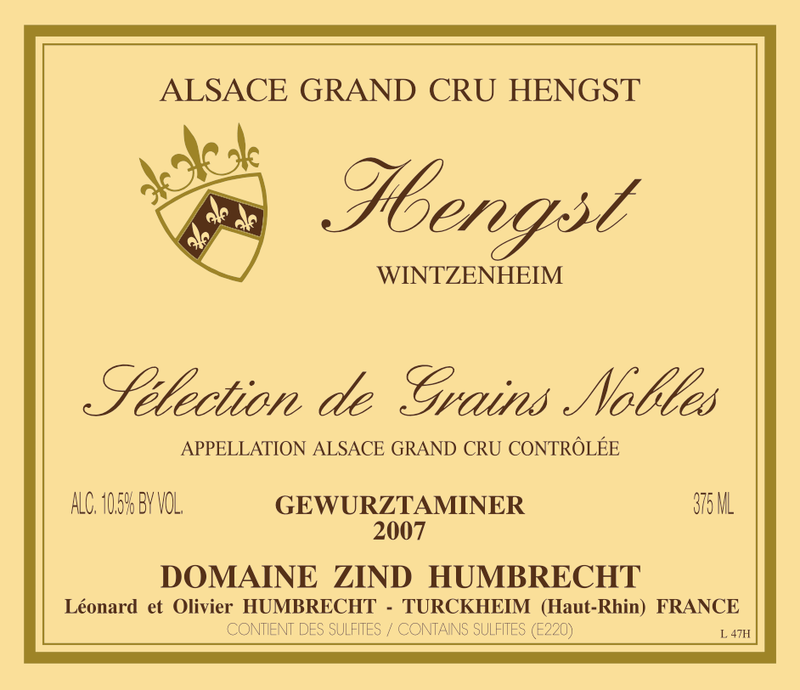 Hengst is a vineyard well exposed to the sun and enjoying a relatively dry climate. Botrytis does develop in the Hengst, but quite late and in relatively medium intensity, sometimes enough for producing great VTs (2006, 1994, 1990…) but never enough for a proper SGN, until 2007. For similar reason as for the Goldert SGN, we decided to take our time and select the noble rot. I must stress that the quality and amount of noble rot must be large enough so selecting it would not lower the quality of the classic Hengst that would be harvested just after the SGN. The vines are very old, the grapes are small and would only develop noble rot once perfectly ripe, and of course, in this vineyard, the acidity (and therefore the structure) is always very high. Everything was in place for allowing this wine to carry an enormous richness, so the selection was quite severe, but we were still amazed when we realized the ripeness reached 202° Oechslés or just above 30% potential alcohol. Technically, it could be a Trie Speciale for us, and this is why you will see it on the corks of this wine! However, as the fermentation was very much Hengst-like, the residual sweetness is not as high as expected in such wines, so we decided not to call this wine like this. 2/2009: this wine is in bottle for some months now and shows delicate aromas of ancient roses, jasmine flowers, spices, saffron, pepper… The delicacy of the nose is almost misguiding, because the first sip will reveal a huge palate with intense aromatics. The vineyard of the Hengst proves that it is capable of overpowering the sweetness and simple varietal flavours. Please do not call this dessert or pudding wine. This is Hengst!